1. I am a huge Heston Blumenthal fan. I like his scientific approach to cooking and was therefore interested to see how good a blender would be that he was happy to put his name on. 2. I blew up my blender recently whilst trying to crush ice. 3. I already own the Heston Blumenthal precision scales and think they are fantastic. On opening the box, there is the blender itself, some plastic tools and a recipe book. This is a great help giving you ideas of what to make whilst you are getting used to your new blender. The knob on the right can be adjusted to whatever speed setting you require from stir to mill. There are pre set programmes on the machine which are designed to make life simple for you. You don't need to think what to do, just put in your smoothie ingredients, press the smoothie button and a minute later you have the smoothiest smoothie you have ever tasted. It is that simple. There is also a soup button. For a simple soup I filled with cold water, frozen peas, mint and an oxo cube. Hey presto a soup warmed by friction. Cleaning again is simple. Just add water and a drop of washing up liquid, press the auto clean button and it cleans itself. I have made the boys smoothies after school, cocktails for me and frozen desserts. The recipe book is a great start to help you get confident with the blender. (Word of warning, it is also sold in Australia where lebanese cucumbers are common - here a normal cucumber works fine.) The wand/paddle is only needed when making frozen desserts. It does require a bit of (wo)manpower for a minute or so but the results are yet again amazing. The wand is inserted into the top of the machine and used to press down the ingredients whilst the forzen dessert programme is running. You can watch me make the most wonderful Mango, Lime and Coconut Gelato below which shows you how to use the frozen dessert setting. The Boss does come with a large price tag, however, if you enjoy cooking and want to eat more fresh fruit and vegetables then it is most definitely worth paying extra for a quality machine. It also comes with a 7 year warranty. I think that The Boss is going to change the way we eat in our house. We no longer need to throw fruit away as it can be frozen and used in smoothies. It is easy to use with the pre set programmes, cleans up after itself (if only my children did) and I am totally in love with it. I was given the blender for the purpose of this review, but all the opinions are my own. It really is that good!Affiliate links included. Sounds great and looks sturdy too! Great review and autoclean, what a wonderful product. Yes auto clean had me sold! 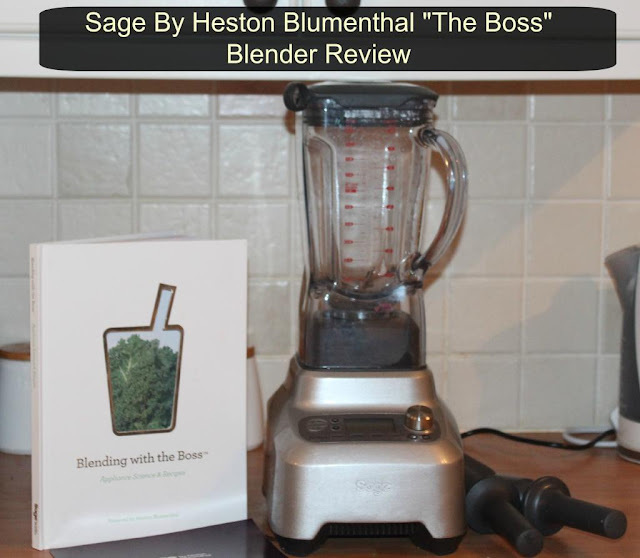 The Boss looks 100% more advanced than my little blender, I'd love one! Would love one of these, very advanced compared to my current blender. They do don't they! I have my eye on his coffee machine! Yes my little blender couldn't cope with ice - this is very clever! So far I haven't broken it. ooooo I have seen his tea maker as well which looks good. Yes my old one was slow and even slower! Great review & thanks for the pictures too. V informative. Would love to have one to make healthy smoothies. I have to say that looks awesome! I think it's going to change the way we see 'standard' blending. looks fab - could make some fantastic soups with that!